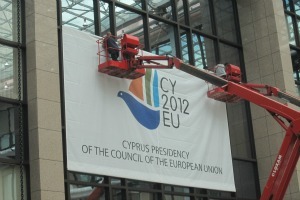 This is the first EU presidency for Cyprus, which joined the EU in 2004 and became a euro zone member in 2008. The country sees its EU stint both as a challenge and an opportunity. As a relatively new member state, it hopes to enhance its image as a credible and responsible member of the Union. Cyprus assumes the rotating presidency of the Council of the EU in difficult times and in a tense atmosphere with Turkey, an EU candidate country that doesn’t recognise and has occupied the northern part of the island since 1974. Despite the occupation, Northern Cyprus is technically EU territory. The so-called Northern Cyprus Turkish Republic is recognised only by Ankara and its only air link is with Turkey. It is also excluded from international sport, finance and trade, and is heavily subsidised by Ankara. Turkey stated that it will boycott the Cyprus presidency, or freeze relations with the EU, and even warned that it could annex Northern Cyprus if no agreement was reached on the reunification talks. Cyprus is heavily exposed to the Greek crisis and is in search of a bailout to salvage its banking system. But the small island doesn't rely exclusively on Europe to solve its problems and could obtain, for the second time, a multibillion euro loan from Russia. Cyprus is the only country represented at EU summits by a Communist –President Demetris Christofias, who has remained true to his values since he joined the Communist AKEL party in his youth. Christofias has studied in Moscow and speaks Russian fluently. Russia's political presence and economic penetration in Cyprus has no equivalent in any other EU country. Despite the daunting difficulties, Cyprus wants to help steer the Union in its most important objectives, the first one being the progress of talks to agree the next EU budget for the period 2014-2020. At the end of a two-day summit (12 and 13 December), EU leaders congratulated Cyprus for its productive presidency. Council President Herman Van Rompuy also praised the president of Cyprus, Demetris Christofias, for the “excellent cooperation” between his office and the Cypriot EU presidency. Van Rompuy praised the presidency for its work in MFF negotiations. “It was indispensable work, even if we will only reach the final deal early next year ,” he said. The Council president gave credit to Cyprus for helping to establish an EU-wide patent, after the European Parliament voted on Tuesday in favour of the plan, ending what Van Rompuy called “a 40-year-long Odyssey”. European Commission President José Manuel Barroso cited other achievements of the Cyprus Presidency as “especially important” - the Single Supervisory Mechanism, Schengen governance and the common asylum system. The Cypriot president singled out maritime policy as one area where he was particularly proud of progress made. “With the Limassol Declaration, we have given a new dynamism to the huge possibilities and opportunities that arise from marine and maritime activities in creating new employment,” he said. He also stressed as a “success” what he called the “timely agreement” for the 2013 EU budget, as well as the agreement achieved the night before the summit on the Single Supervisory Mechanism (SSM) for the future banking union. The island of Cyprus has changed hands many times in history due to its strategic location in the Mediterranean, having been occupied by the Egyptians, the Roman Empire and ancient Greece under Alexander the Great. The ties between Cyprus and Turkey are ancient as well, the island falling under Ottoman rule in 1570. Uprisings took place in the 19th century, although none were successful. In the aftermath of the Russian-Turkish war (1877-‘78), which Turkey lost, Cyprus was leased to the British Empire, although it remained de jure Ottoman territory. The island attained independence in 1960, with the UK retaining two military bases. On 15 July 1974, the Greek military junta in Cyprus carried out a coup d’état to unite the island with Greece. In response, on 20 July the Turkish army invaded the island. Despite repeated efforts under the auspices of the UN to bring the leaders of the Greek and Turkish Cypriot communities to the negotiating table, the island has remained divided, its northern part remaining under Turkish control. Hopes were raised in 2002 when UN Secretary-General Kofi Annan presented a reunification plan, suggesting a two-part federation with a rotating presidency. In April 2004, on the eve of the Cyprus EU accession, the Greek Cypriots rejected – and the Turkish Cypriots approved by referendum – a UN-sponsored unity plan known as the Annan Plan. The plan's failure disappointed EU officials, who had agreed to allow Cyprus to join the EU that year partly in the hope that doing so would encourage a solution to the dispute. On 1 May 2004, the Republic of Cyprus became a member of the EU. At their December 2004 summit, EU leaders agreed to open accession talks with Turkey on 3 October 2005. One of the conditions specified was for Ankara to extend a 1963 association agreement with the EU's predecessor, the European Economic Community, to the Union's 10 new member states (EU-10). This group includes the Republic of Cyprus, which is not recognised by Turkey. In July 2005, Turkey signed the so-called Ankara protocol, extending its customs union to the EU-10 states, but at the same time it issued a declaration saying that its signature did not mean it had recognised the Republic of Cyprus. Turkey also refused to open its ports and airports to Cyprus, as it claims the EU has fallen short of a commitment to trade directly with the unrecognised northern part of the island. Reunification talks are discretely ongoing between the president of the Republic of Cyprus Demetris Christofias and the leader of the Turkish Cyprus community Dervi? Ero?lu, under the watch of Alexander Downer, the UN's special advisor on Cyprus and a former Australian foreign minister. However, since the hard-line Ero?lu took over from Mehmet Ali Talat in 2010, the talks made no significant progress. In April 2012, UN Secretary-General Ban Ki-moon said progress in the talks was insufficient to call an international conference. The statement appeared to put an end to hopes that Cyprus' upcoming EU presidency could be a catalyst for the resolution of the Cyprus problem. Turkey’s accession talks are largely paralysed because of the Cyprus issue. So far, only one accession chapter (on science and research) has been provisionally closed. Eleven more have been opened, but eight remain blocked over Turkey's failure to implement the 2005 Ankara protocol. In the recent period, Cyprus suffered both from the eurozone crisis and its exposure to Greece, as well from a major blast that destroyed the island's largest power station on 11 July 2011. The country’s credit rating has been successively downgraded - Moody’s downgraded the country’s debt on 13 June 2012 to Ba3 from Ba1, pushing Cyprus further into junk territory. The recent Commission “in-depth reviews” of the EU members’ economies singled out Cyprus as one of the problem countries. Among the recommendations made to Nicosia are measures to keep tight control over expenditures and fighting tax evasion. Cyprus is expected to seek and obtain a €6 billion-bailout from Russia. This would not be the first time that the island country turned to Moscow – last year Russia gave Nicosia a €2.5 billion loan. At that time, the authorities said there were no political strings attached. Asked to comment on the possible new Russian loan, the European Commission said the EU countries had the right to seek financing on the world market. But cash-strapped Cyprus may be sitting on a mountain of gold. Large gas fields have been identified in its territorial waters and, in September 2011, President Christofias announced that a US firm, Noble Energy, would begin exploratory drilling to confirm deposits beneath the sea bed off Cyprus' southern coast. The Cypriot press reported that the drilling rig took place in the Republic of Cyprus' Exclusive Economic Zone, under the watchful eye of Turkey's naval and air forces. Turkish EU Minister Egemen Ba??? said if the EU thought it could reach these sources in disputed waters bypassing Turkey, it was “mistaken”. Turkish news media reported that there was a massive natural gas reserve of 3 trillion cubic meters in the region. This could put Cyprus very high in the world list of countries with important gas reserves. The total proven gas reserves for the European Union is of 2 trillion cubic meters. Noble Energy was planning to start drilling in the second half of this year. Gas is not expected to generate economic benefits before 2018, given that storage and condensing facilities still need to be established in the Republic of Cyprus. Regarding the diplomatic "style" of the Cyprus presidency, officials said they would provide leadership to the Union but “not in the traditional way”. Nicosia has already sent some 200 diplomats and civil servants to Brussels to prepare for the presidency, shifting the bulk of the country’s administrative resources to Belgium. Diplomats called this a “Brussels-based presidency” – a novelty. The distance to Brussels appears to have weighed heavily in the decision as Nicosia is the EU capital which is the most distant from the Belgian city. As a small country of barely 1 million people, Cyprus aims to act as an “honest broker” in the Union. Precisely because of the country's small size and difficult diplomatic situation, Nicosia wants to keep its presidency agenda modest, but also "relevant". According to Cypriot diplomats, Nicosia prefers the term "relevant" to "strong" or "stronger", which they see as too controversial. This is why the motto of the Cyprus presidency is: “Better Europe”, one that is more relevant to its citizens and the world. Worldwide, Cyprus plans to promote Europe as a “filoxenos topos”, a hospitable place. Stemming from its modest ambitions, Cyprus wants to concentrate on a limited set of priorities. The biggest one will be to make progress on the Multiannual Financial Framework (MFF) – the EU's long-term budget for the period 2014-2020. But while the MFF tops the priority list, Nicosia understands that such a major issue will be handled primarily by European Council President Herman Van Rompuy. Under a national perspective, Cyprus attaches special importance to the Common agricultural and fisheries policy, as well as Cohesion policy and Research and Innovation policy. Cyprus admits that it would not be realistic to expect a final agreement on the MFF during its term, but at least a “political agreement”, leaving the final work for the Irish EU presidency in January 2013. A “negotiating box” on future MFF talks is been prepared by the Danish presidency and at the EU summit 28-29 June it was decided that an agreement on MFF should be reached by the end of 2012. MFF will be on the agenda of the General Affairs Council on 24 July, Deputy Minister Andreas Mavroyannis said on June 2. Then, at the end of August, an informal gathering in Cyprus of the European affairs ministers would be entirely devoted to discussing the long-term budget, also including a session with the negotiating team of the European Parliament. "We want this to be a moment of truth, when we are going to compare positions and try to come closer a deal," he told reporters as Cyprus took over the presidency. Then, in September, for the first time, the Cyprus presidency may “try to test some figures”. The Danish presidency had the same ambition, but it proved “not possible” from such an early stage, the diplomat explained. The aim, Mavroyannis said, is to have before the EU summit on 18-19 October the main elements to move forward, those being a political understanding amongst member countries and “at least” an implicit understanding with the European Parliament “on how, when and what”. This implies not only the expenditure side, but also the revenue side, the so-called “own resources”. Partly problematic is the decision-making process, which could prove tricky on the revenue side, as ratification by member states could be required if new resources are added - such as a financial transaction tax (FTT). Countries’ positions on this topic were “very entrenched”, the diplomat said, adding that “own resources don’t need to be essentially an FTT”. European Ministers of Foreign Affairs met in the Cypriot capital Nicosia on August 30 to hold informal talks with leading lawmakers in order to smooth the decision process with the European Parliament, which is co-legislator on budgetary matters. Also present were European Commission Vice-President Maroš Šef?ovi?, responsible for inter-institutional relations, and Commissioner Janusz Lewandowski, in charge of financial programming and budget at the EU executive. “This is a watershed moment for the negotiations,” said Andreas D. Mavroyiannis, the Cypriot deputy minister for EU Affairs who chaired the meeting. Mavroyiannis reported on the bilateral consultations which Cyprus has held with the remaining 26 EU members and Croatia, which is expected to join on 1 July 2013, collecting their “wish lists” for the next long-term budget, called Multiannual Financial Framework (MFF) in EU jargon. On 3 September, President of the European Council Herman van Rompuy announced a special summit on 22-23 November which will focus on the European Union budget for 2014-2020. That summit ended without a firm agreement, which meant that the MFF negotiations had to carry over into 2013. Another big priority is the Commission's proposal for an Integrated Maritime Policy, which the EU executive hopes to revive during the Cyprus EU presidency. As Nicosia sees it, a coherent approach could help, for example, off-shore wind farms to co-exist with shipping, which in turn could affect ports. A high-level conference on maritime policy is planned in Cyprus in October, with the participation of Commission President José Manuel Barroso, who is a big supporter of the project. Cyprus is also keen to deliver on the EU common asylum policy, which the Commission hopes to close before 2013. Cyprus, itself affected by migration flows from Africa, is concerned by the stand-off between the European Parliament and Council over the rules governing the EU's border-free Schengen area, which member states want to re-write unilaterally. On foreign relations, Cyprus attaches special importance to the Southern Dimension of the European Neighbourhood policy, by promoting relations in its Mediterranean environment. According to Cyprus diplomats, the EU has been taken by surprise by the Arab Spring, because Brussels had no contacts with civil society groups in the region. Nicosia says it will support programmes involving civil society, promoting respect for human rights and protecting ethnic minorities. On enlargement, Cyprus said it wanted to make progress on EU accession talks with the Western Balkans, Iceland, and also Turkey. A more European Turkey would be in the interest not only of Cyprus, it would be in the interest of the European Union, Cypriot diplomats said, adding that it would be in the interest of Turkey as well. But they added that for this to happen, Turkey “should play by the rules of the game”. Plan B to spoil the party? Relations with Turkey indeed appear to be the biggest challenge for Cyprus. While Turkey has EU candidate status, it doesn’t recognise the government in Nicosia. Turkish officials have stepped up the pressure on Nicosia ahead of its presidency, stating Ankara would boycott the Cyprus presidency, or freeze relations with the EU. It even warned that it could annex Northern Cyprus if no agreement was reached on the reunification talks. Ankara's plan is to change the name of the Turkish Republic of Northern Cyprus and replace it with “Cyprus Turkish Republic”, Turkish media have reported. This would imply the same degree of statehood to both parts of the divided island. Reportedly, passports on the northern part of the island will be replaced with a new mention of nationality: “Cypriot Turk”. An unnamed Turkish official quoted by the Turkish daily Milliyet said ‘Plan B’ would take effect after 1 July. In what can be seen as a message that reunification talks should not take a break during the six months of the Cypriot presidency, Füle said that “the worst thing to happen would be to stop talking to each other”. In what can be seen as an attempt to keep Turkey interested in the EU process, the European Commission signalled that it could finally give the green light to visa liberalisation with Turkey. According to the liberalisation process, journalists, businesspeople, artists and athletes would get multiple visas valid for 2 to 5 years. Turkish Foreign Minister Ahmet Davuto?lu said Ankara will carry out its threat to cease contact with the EU presidency when Cyprus assumes the role on 1 July. However, it will maintain ties with the European Commission, Davuto?lu said after a meeting with EU officials on 7 June 2012. "Our position on the presidency of the Greek Cypriots is clear,” he said according to a Reuters report. “The relations and contacts with EU will continue, but none of the ministries or institutions of the Turkish Republic will be in contact with the EU presidency in any of the activities related to Greek Cypriot presidency." Meanwhile, the Cypriot Ambassador to the EU, Kornelios Korneliou, seemed confident about his country's chances of advancing talks with Turkey. “If Turkey delivers, we are going to deliver," he told a public event held in Brussels on 6 June 2012. "The bilateral issue we have with Turkey will not be part of our presidency. Turkey doesn't want anything to do with the Cyprus presidency. Turkey decided this policy. It’s very unfortunate." He continued: “We should not forget that geography does not change. A more European Turkey will be in the interest not only of Cyprus, it will be in the interest of the European Union, it will be in the interest of Turkey. But we should play by the rules of the game. Big members such as Germany play by the rule of the game. Turkey should do the same”. Andreas Mavroyannis, deputy minister to the president of Cyprus for EU affairs, insisted that his country would not mix the “Cyprus issue” with presidency business. “But at the same time we cannot accept that Turkey comes and tells us the first of July is the absolute deadline for the solution of the Cyprus problem because then we have a plan B,” he said at a public event organised on 20 June 2012 by the Centre for European Studies, the European People's Party (EPP) think tank. “So it’s not us who are establishing a link [between the presidency and the reunification talks], it’s Turkey." Speaking at the same event, Ioannis Kasoulides, vice chair of the EPP group and member of the opposition Democratic Rally in Cyprus, blasted Turkey for having “provoked” his country by inviting the UN mediator for the reunification talks less than two weeks before the start of the presidency on 1 July. He said that during the Cyprus presidency, Turkey would be treated “as any other country,” despite the tensions. He added that there were “available chapters” in Turkey’s accession talks to be opened, such as the competition chapter, but said Ankara didn’t want to open them. MEP Markus Feber (EPP, Germany) said at the same event that he was not a supporter of Turkey’s full EU accession, although he knew the country well and had visited it more than 30 times. Ferber described as “provocations” the statements by Ankara that it would boycott the Cyprus presidency. He said that by signing the Ankara protocol of 2005, extending its customs union to the 10 countries that joined the EU in 2004, it had indirectly recognised Cyprus. Turkey must respect the fact that President Demetris Christofias is not only representing Cyprus as of 1 July, but the whole of the European Union, said the president of the Group of Socialists and Democrats (S&D) in the European Parliament, Hannes Swoboda, on a visit to Cyprus on 19 June. Speaking after meeting with Christofias, Swoboda said he was “disappointed” with the lack of respect shown by Turkey to Cyprus and its upcoming EU presidency, the Cyrus Mail reported. “It is a European presidency. Turkey cannot expect from Europe compromises if it doesn’t respect the decisions of the EU. President Christofias is not representing only Cyprus, he is representing the Union in these six months and this has to be respected by Turkey,” said Swoboda, who called on Turkey to make moves to push forward its EU accession path by behaving more responsibly with regard to the reunification of Cyprus. Speaking after a meeting on 21 June with members of the liberal party of Cyprus United Democrats and Turkish Cypriot political leaders, MEP Graham Watson, president of the European Liberal Democrat and Reform party, said: "Communities kept apart by barbed wire have no place in the European Union. All politicians on this island know by now what is needed to unify its people. All that is absent is the political will. President Christofias should use his presidency of the European Union to steer the island to an EU-backed solution." The leader of the United Democrats, Praxoula Antoniadou Kyriakou, also called for the EU presidency to be used to find a solution rather than for campaigning in a presidential election for half of the island. "If a solution is in place by the end of the six months, a president could be elected for a united island," she said. “Cyprus takes over the Presidency of the EU at a very fragile point in the history of the EU. Not only will Cyprus have to take over the business of dealing with the Euro-zone crisis from the Danes, but they themselves have to cope with a very serious economic situation, for which it seems that they will also require a bailout. “Where this money will finally come from – the EU or Moscow – is being hotly debated, with Nicosia once again coming under criticism for its close ties with Russia. Cyprus historically has close ties with Russia, with thousands living on the island. More than 40.000 Russian’s live in Limassol alone. “As every country Cyprus wants their Presidency to be remembered positively and they have been adamant that they wish keep their bilateral problems with Turkey, and the “Cyprus problem” off the agenda. However, this could prove to be more difficult in practice. “While Turkey has declared it will not deal with the Cypriot Presidency – something which the EU has criticised Turkey for, Turkish Cypriots feel upset that while the Greek Cypriots will be enjoying their moment in the sun, they remain excluded and isolated. This has been compounded by the fact that the latest round of talks to reunify the island has been put in the deep freeze, during the presidency, which has left Turkish Cypriots frustrated. “Indeed Turkish Cypriots are planning a protest in Brussels later this week. Still I wish the Cypriot Presidency all the best of luck and I hope they manage to find success in some of their priorities, including efforts to improve employment opportunities and push a “better Europe” agenda, trying to make it more relevant and interesting to citizens, reducing the anti-EU sentiment which has grown as a consequence of the Eurozone crisis. “In EU history it is often the smaller states that produce the most surprising and positive results,” Amanda Paul concluded. Big trees grow from very small seeds ! Big or small Cyprus will show its legitimacy among giants if it keeps a good and progressive presidency. We will all know in only six months ! ‘Russia’s political presence and economic penetration in Cyprus has no equivalent in any other EU country’ – I am sure Russian economic penetration in Bulgaria is far larger, but at that it is also in the shadow. let’s see what happens to your Cyprus if Syria kneels down in front of NATO and Russian bases have to leave Syria. That was why frau M. hugged greek-cypriot leader when visitng the island in 2011: reaching the natural resources in meditteranean by-passing Turkey. she talked opposite of what EU officials who had followed the reunification talks had said earlier. Big powers of world has defined a situation as legitimate and making use of it by-passing Turkish interests.